Lauren is certified in the Handwriting Without Tears® (“HWT”) curriculum to teach handwriting skills from the toddler years through grade five. She has used the HWT program successfully with children struggling with handwriting. Handwriting practice does not need to be boring. The HWT curriculum is both fun and effective, providing sensory-based and hands-on techniques for pre-writing and writing skills. Lauren brings a unique energy when teaching handwriting, capturing your child’s attention and motivation to succeed. She focuses on building your child’s confidence every step of the way. Using the “HWT” curriculum, Lauren offers 2 of her own handwriting programs for children at different stages of handwriting development. Handwriting difficulty can be related to developmental delays in fine motor skills and/or sensory integration. In these types of situations, handwriting therapy is often more effective when combined with an overall treatment plan to address such delays. For example, activities aiming to improve muscle strength, endurance, posture, and grasping patterns, will often be incorporated into handwriting treatment sessions. 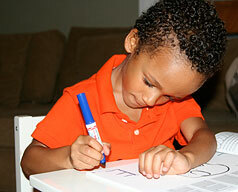 Lauren will design the appropriate handwriting program based on your child’s individual needs.